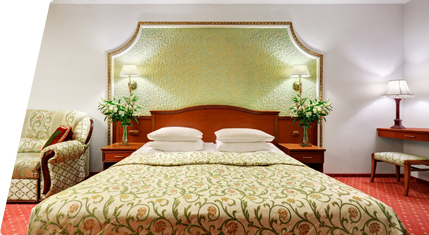 Assambleya Nikitskaya is a cozy four-star hotel in the very center of Moscow. The hotel is located in a historical building at the intersection of Bolshaya Nikitskaya Street and Gazetny Lane. Just two blocks away from the Red Square and within a walking distance from Moscow's most significant landmarks, our rooms are decorated with style and genuinity and can comfortably accommodate you whether you come here on vacation or on business trip, be you single, just-married, or a couple with children. Hotel's website – Let's get to know each other! Our new version of Assambleya Nikitskaya Hotel's website will not only facilitate booking a room, but can also serve as a source of useful information and tips for your journey. The best hotels in Moscow are considered to be found in the center. However, location is only one of the many advantages of staying at our hotel in the center of Moscow. Here at Assambleya Nikitskaya, high standards of hospitality are our top priority – it is very important to us that each of our guests feels taken care of, and has a pleasant worry-free experience. 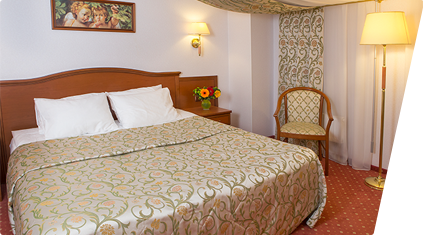 Assambleya Nikitskaya is a fine hotel in Moscow with a relatively small amount of rooms and suites. This allows us to focus our attention on each of our guests individually – such approach is sadly seldom practiced by other Moscow hotels of 4 or even 5 stars. Please be reminded to book a room in advance to be able to pick the best prices. If you are looking to rent a hotel in Moscow for a business event or a family celebration – you will hardly find a better hotel than Assambleya Nikitskaya in the very center of Moscow and near the underground station. Moreover, should you have come to Moscow on vacation or on business – there will be no need for you to stress over long rides or worry about stopping over or changing transport; Assambleya Nikitskaya is in the perfect vicinity of the Okhotny Ryad and Biblioteka Imeni Lenina underground stations, besides, our receptionist is always at your service, should you like to order a taxi. It may take some time and effort to pick the right four-star hotel in Moscow. We are heartfully grateful for the trust you put in us, and we are happy to welcome you among the dearest guests of Assambleya Nikitskaya Hotel! ▶ Our address: 12/c.2 Bolshaya Nikitskaya Street, near Okhotny Ryad or Biblioteka Imeni Lenina underground stations.